Do you have a natural way with the ladies? Or wish that you did? We can see why your idol is the man who started it all. The Bachelor lifestyle. The land of beautiful women. Cigar lighting, and smoke jacket wearing Hugh Hefner. You have studied everything the man ever did. Examined closely the origins of the mansion that everyone knows today. Heck, you weren’t even surprised to see his magazine go back to more classy roots. But you’ve never been able to capture the suave demeaner of the man you so idolize. And that is partially do to your lack of the Hef style. You are going to have to step up your wardrobe game if you want to be like the great Hugh Hefner. An easy way to do that is with this Plus Size Hugh Hefner Costume. Now, don’t get us wrong, by clicking the “Add to Cart” button, you won’t be instantly swarmed by chicks. No, that’s what Axe body spray does (watch a commercial)! No, you won’t be wantonly attacked by every babe to walk down the street. 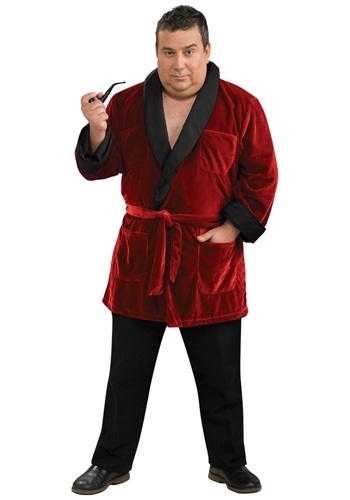 But the classic red velvet smoking jacket will give you the kind of confidence that the Hef has exhibited for, what feels like forever. You will find it much easier to talk to a beautiful girl when you become the man you have always admired.